So runs the headline of the article written by Joe Nocera published on Bloomberg, February 28, 2019. It goes by the heading of you never know who will read your book. Nocera wrote me from Telluride, having found the story as he relates in the article, and asked me if the story was true. The story was true and the fiction was true. His article was picked up the next day in its entirety by Financial Advisor Magazine. Today, ten years later, the story of C.C. Wain is as true as ever. C.C. Wain, a small town banker, saves his depositors from losing their money in the banking failures of the Great Depression. He tells his story in the simple language of a modest man who never views himself the way his world did — as a depression-era Robin Hood. This fictionalized account of actual events takes us through his intricate manipulations to “borrow” the money, the hilarious nationwide manhunt leading to a chance apprehension, and the dedicated prosecution he suffered, ultimately for a crime he didn’t actually commit. Released from prison three months before FDR signed into law the very act for which he had been jailed. C.C. lives life in obscurity long enough to see all his debts repaid. Along the way, readers will glimpse how the blind self-interest of bankers and prosecutors justifies any loss suffered by others at their hand. 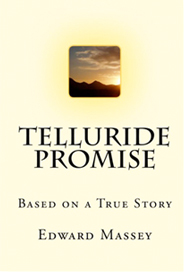 Telluride Promise is as relevant now, eighty-five years later, as it was in the time of C.C. Wain. We face once again a crisis of crushing despair that sadly needs simple men to stand up for the promise they gave to people who trusted them. We need C.C. Wain more than ever. He lives with us in his words and in this book. Amazon.com and Penguin Group (USA) named Telluride Promise a quarterfinalist of the 2010 Amazon Breakthrough Novel Awards, an international competition in search of the next popular novel. The Amazon Breakthrough Novel Award competition considered up to 10,000 entries from authors around the world. The contest was co-sponsored by Amazon, Penguin Group (USA) and CreateSpace.